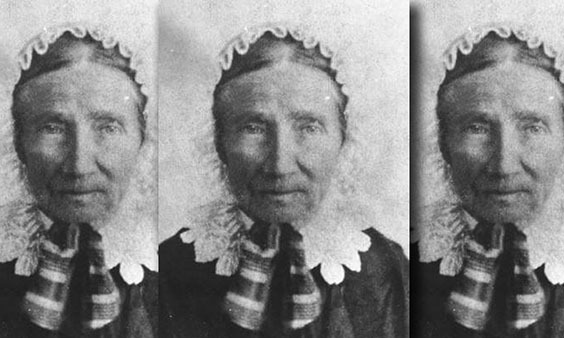 Tabitha Brown was sixty-six years old when she headed west with her family in 1846. As a widow she had reached a time when many were content to ease back in a trusty rocking chair and just watch the flood of covered wagons passing by. Not spunky Tabitha Brown. Oh, she liked her rocking chair well enough. There is no doubt about that. Her rocking chair went west with her, most of the way. As Tabitha crossed the plains, if a fair sized wind had danced over her, as it waltzed tumbleweeds along, it surly could have tumbled her and never missed a two-step. Tabitha didn’t weigh more than 108 pounds, and that was after she’d eaten some regular meals out in Oregon for a few years. Grandma Brown, with a lame leg from paralysis, was living proof that nearly anyone with two feet and a bucket of gumption could make it to Oregon. Several years before her westward adventure she had hauled her family of two sons, a daughter, and her brother-in-law from the east to St. Charles, Missouri. She had taught school at various places after the death of her husband. She continued to do so in Missouri. It was a profession that would cause her to be remembered in the history of Oregon. By 1843 Tabitha’s son, Orus, could no longer watch all the people leaving the edge of civilization for the west. It was the year of the Great Migration to Oregon and Orus joined in. By 1843 he was back in Missouri, declaring that he’d found Paradise. Soon after, Grandma Brown, with her brother-in-law who was now seventy-seven, son Orus and his family, and daughter Pherne with her husband and children started west. Her other son, Manthano, stayed in Missouri. Their journey was fairly easy for about the first fourteen hundred miles. That distance took them across the Great Plains and the Rocky Mountains, then to Fort Hall in present-day Idaho. Only some six hundred miles were now left. The regular route followed the Snake River to the Columbia, then down to the Willamette Valley in Oregon Country, but a quicker route was being promoted. It would be known as the Applegate Trail. The Brown family, and others, trusted the promoter and took this new trail. It was too late to turn back when they discovered the Applegate Trail would take them hundreds of miles south of Oregon into Utah Territory and California before it turned north towards Oregon. And the promoter had deserted them after being paid. October and a hint of winter came and still they were on the trail. The Klamath and Rogue River Indians attack, stealing most of their cattle. While passing through a canyon in the Umpqua Mountains all of their wagons but one broke down. Tabitha lost her wagon along with her rocking chair. Now she’d have to ride a horse. Worse yet, they were nearly out of food. Her brother-in-law was nearly starving so Tabitha took him and went on ahead of the rest to save his life. He nearly died but she got him through. On Christmas Day, 1846, the Brown family was together again in Oregon. In Oregon City Tabitha started a school for homeless children and cared for them as a mother. Her little school was one of the first in Oregon Country. Within a decade it was chartered as Pacific University and is still in operation today.